DAMNATION ALLEY is a hazard-plagued corridor running across a nuclear-war ravaged America. Our heroes must navigate this to reach what they hope is a fallout-safe area. The folly ridden box canyon that is the movie is a legendary example of how a decent idea and big plans can get almost totally berked up. Given a large budget ($17,000,000), 20th planned this as their big sci-fi release for 1977, putting not nearly as much interest in the smaller-outlay toss-off they had as fallback—Star Wars. Lukas Heller (The Dirty Dozen) came up with a screenplay that pleased the book’s author Roger Zelazny. Zelazny wasn’t informed until he saw the results in a theater that another writer (Alan Sharp, Ulzana’s Raid ) had scuttled Heller’s work. Jack Smight was brought in to direct, on the strength of his two recent hits—Airport 1975 and Midway—with no-one in management bothering to take into account how lousy both those movies were. Smight and company made a total bollix of the special effects, which involved giant scorpions and armor-plated, meat-eating cockroaches (I can see everyone putting this on their must-see list). As one critic observed, with half the budget Lucas made Star Wars look like ten times as much. This foisted cheesy second-string work akin to the 1950s, without the charm of b&w , John Agar or Richard Carlson. The mis-match of rear-screen blow-ups with live actors is just pathetic. Plausibility holes in the script come one after another as George Peppard and Jan Michael Vincent face the creatures (Vincent spends 30% of the 92-minute running time dodging things on a motorcycle), find foreign import Dominique Sanda alone in Las Vegas (casinos submerged in dust but the electricity still works), fight lustful hillbillies with nuclear acne and leave hapless Paul Winfield to the hungry bugs. Murray Hamilton appears at the beginning, has no dialogue, disappears. Three elements do what they can to salvage the mess. Jerry Goldsmith got the score, so that’s covered. Seeing that the monster effects were horrible, some really cool atmospherical electromagnetic storms and cloud swirliness were matted into the background for the whole journey: they look fittingly catastrophic, like malevolent Northern Lights. 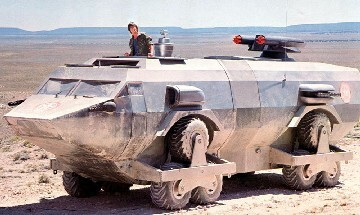 The conveyance used to get past all the dopiness is an all-purpose LandMaster: a nifty,12-wheeled, amphibious, rocket-armed, shatter-impervious mobile home situation capable of 60 mph. It cost $325,000 (make that over $1,500,000 now), and has been a sought-after item since, much like the Aston Martin used by our English buddy. Aside from these credits, the movie actually starts off with some decent chill, depicting the sudden nuclear exchange that messes up the atmosphere and population (to say nothing of the Interstate Highway System): it’s sobering to think we’re in the same sorry boat 38 years later. Bombs away, humans—as this did—making only 25% of what it needed to justify those lousy insects. With Jackie Earle Haley (kid to pick up, en route) and Robert Donner (bearded scavenger to waste, en route).